The scuffed impression showing where the mountain lion lay down. I booted up and went outside to take a look. Yup. Mountain lion. Not big, but clearly present and evidently quite at home, judging from the loosely curled body print on the driveway. Seems the cat took a little break, settling down for a spell to take in the view down the slope overlooking the back of the barn and the barn pasture. I’m not astute enough to notice the subtle impressions left by feline paw pads on gravel, grass, or pine needles, so I’m less likely to notice that a mountain lion has been around in summertime. I know they’re here year-round, and from a philosophical standpoint I deeply appreciate that fact. Like the ponderosa pines and the mule deer and the Clark’s nutcrackers, mountain lions are rightful citizens of this place, and their presence signals that the hillsides we live on are part of a functional ecosystem. 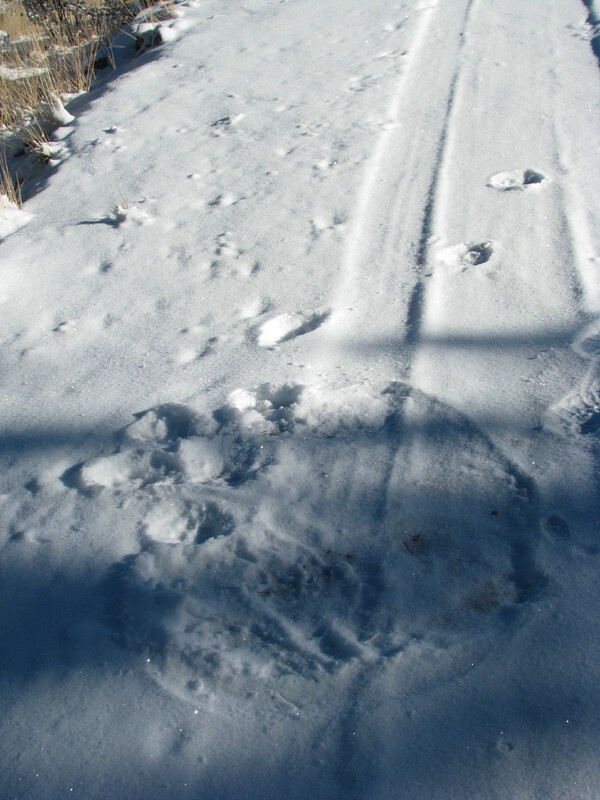 Because snow provides a blank canvas that automatically records their passage, when we do find the rounded florets of mountain lion paw prints, it’s usually winter. Most often, we come across tracks about a half-mile northwest of the house, where a gravel road that makes for an easy stroll on a wintry day cuts through a stand of evergreens. The recent set of prints marked the first time since we’ve lived in the house that we’ve seen mountain lion sign so close to home. Time spent outside is, for me, usually time spent thinking and looking, but my mind’s trajectory during my evening walks down to the barn have, of late, been unusually organized. I’m not merely looking with a neutral eye, to see what there is to see. I’m looking for something—specifically, for tawny hide or a pair of front-mounted predator’s eyes. It’s a different style of attention. I feed around 5:00 p.m.: in broad daylight in summer, at sunset in these foreshortened winter days. Mountain lions are crepuscular: they’re most active at dawn and at dusk. Our driveway cuts through a fringe of trees strung along a finger of ridge that extends between the house and the barn. Mountain lions are ambush predators, preferring to lie in wait in woody or rocky areas until prey passes nearby. The mountain lion that paused on its journey was small, which means it was probably young. As a youngster out on its own, I wonder, is this cat cautious, naïve? Or is it bold and cocky, an on-top-of-the-world punk? I consider whether it was just passing through or was perusing this as potential home territory—we have ample deer around, after all. I catch myself thinking how slow and clumsy I am in winter boots and promptly get annoyed at myself. You aren’t supposed to run, you dimwit. Look big. Yell. Fight. Don’t run. Crossing the path of the mountain lion—the tracks long gone, the trail, so far as I know, long gone cold—I think about the thing I like to say about mountain lions, which is that anyone living around here has been seen by a lion far more often than they’ve seen one. I still believe that’s true. 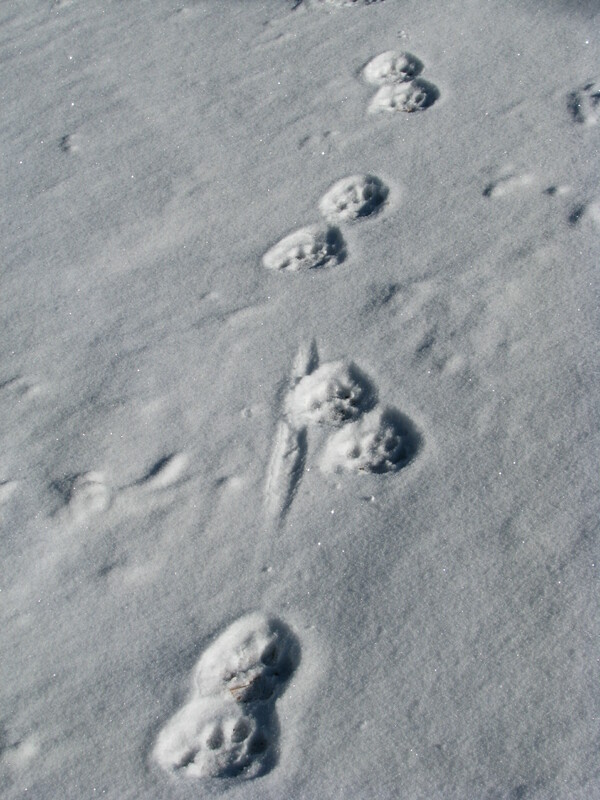 The mountain lions are here, even if we almost never see one and only rarely spot their tracks. As canny predators, they’re observant. As ambush hunters, they’re practiced at discretion. As I go about my routine these days, keeping my evening appointment with the horses, I have to confess that I can’t help contemplating the possibility that there’s a set of feline eyes calmly watching me from behind a shoulder of rock or a screen of branches. Noting my habits. For a week or ten days after Doug and I saw the tracks, the horses were, unsurprisingly, nervous and snorty. They eventually settled down, and I’ve been drawing an extra element of comfort from their relaxed demeanor around the barn, from the rhythmic grinding of their jaws as they chew their evening hay. Such serenity makes for a relaxed walk back to the house, through the gloaming and through the trees. The next time horses jog in hungry but skittish, spooking in short runs to stare up the ridge or down the draw, pausing in their chewing and holding their breath to listen intently…well, I’ll still walk back up to the house, but I don’t know that that the journey will be a relaxing one. I'm a writer and indexer living on a high ridge in central Colorado. I blog about my home place, our horses, short-season gardening, books, and my ongoing project of paying attention. This entry was posted in horses, humans and wildlife, observation, predators, wildlife encounters and tagged animal tracks, mountain lions. Bookmark the permalink. Aye, ’tis a nerve-electrifying turn of events as a human, becoming prey. We’re not supposed to be anywhere in the food chain, we naively believe. I reckon the landscape around home has, or at least had, a brilliance and an edge it didn’t have before. May you and yours continue walking to and fro, unscathed.